Gov. 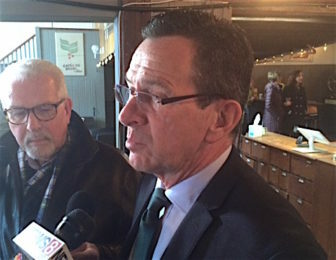 Dannel P. Malloy speaks to the press in Wethersfield. Wethersfield — Gov. Dannel P. Malloy wants to help the beleaguered Department of Motor Vehicles by getting the agency out of the municipal debt collection business and by expanding transactions that can be done at private businesses like AAA offices. Under current law, residents cannot register a motor vehicle if they owe property taxes or unpaid parking tickets to a municipality – a strong incentive to pay municipal debts in a state where most residents are reliant on automobiles. The governor spoke to reporters after an unrelated event a few blocks from the DMV headquarters in Wethersfield, but his administration proposed the changes in an early-morning press release. His legislation, “An Act Decreasing Wait Times at the DMV,” was proposed as the administration tries to address long waiting times and technical issues related, in part, to problems with a new $25 million computer system. Malloy, a former mayor of Stamford, was unsympathetic to the impact the bill may have on municipal revenues.